Short track racing under the lights returns to the MENCS this week as the cars will compete at Richmond Raceway. This track is similar to ISM Raceway (Phoenix), so the drivers who were fast in the race in the desert should be fast Saturday night. The Toyota Owners 400 is scheduled for 7:30 p.m. ET on Fox. It will be a compressed schedule for the MENCS this week. The first practice will be Friday at 11 a.m. ET. Final practice is Friday at 1 p.m. ET. No TV coverage for any practice this week. Qualifying will be Friday at 5:30 p.m. ET (FS1). Our lineups must be set by 8 a.m. ET Friday. Do not forget. Two teams have dominated the races this season and the same two teams have dominated at Richmond. Joe Gibbs Racing and Team Penske have won all of the races in 2019. They have also won 9 of the last 11 races at Richmond. I have been using practice speeds to predict which drivers would run well in the race but it looks like this is the season of momentum. The same drivers keep finishing up front so we need to use them until something changes. Joey Logano (5): Logano started off the season on fire and then had back-to-back finishes outside the top 15 (Martinsville and Texas). I had Logano scheduled for a start at Richmond before the season started but I wanted to see him build some momentum before I added him to my team. Logano finished 3rd at Bristol and led 146 laps. That is good enough for me. Richmond ranks as the 3rd best track for Logano. He has a series-high 5.25 average finishing position and led the 4th most laps at the track over the last two seasons. I want one Joe Gibbs Racing and one Team Penske driver for my team this week. Denny Hamlin (6): If Kyle Busch was not winning so many races this season; Hamlin would be the hot topic in the sport. 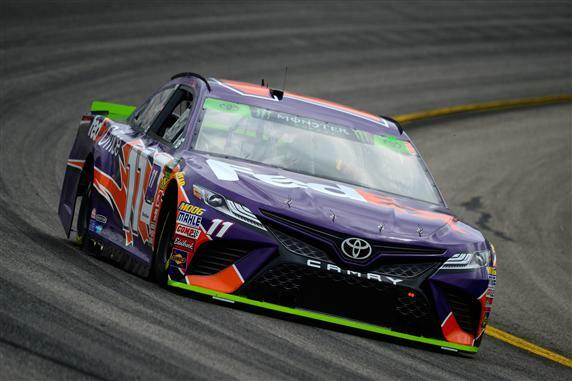 After a poor 2018 season, Hamlin has really bounced back. He has 2 wins, finished every race in the top 11 and has a 5.6 average finishing position (2nd only to Kyle Busch). Now he will compete in his home state where he has the 2nd most wins (3) and led the 2nd most laps (1,659). Hamlin has the most poles at Richmond so he has a good chance to score us qualifying points too. I will use another allocation with the No. 11 car Saturday night. Kurt Busch (8): Kurt said last week that he would have wrecked his brother to get the win at Bristol. Wow, I would have paid to have seen that. Busch is having a great season. He has sucked in qualifying (20.1 average starting position), but has been awesome once the green flag is waived (8.6 average finishing position). If Busch can ever qualify up front he could turn his top-10 finishes into wins. Busch run well at Richmond. He has 9.1 average finishing position in the last 9 races at the track. He should easily finish in the top 10 again Saturday night. Jimmie Johnson (7): I wasn’t planning on using a lot of allocations with Johnson early in the season but he has shown some speed recently. Johnson enters the race this week after back-to-back top-10 finishes (5th at Texas and 10th at Bristol). If he can run that well at those tracks, he should be able to finish in the top 10 at Richmond. Johnson has finished his last 9 races at Richmond in the top 11 with a 6.5 average finishing position. That is pretty consistent. I would love to be able to use another allocation with the No. 48 car this week. Aric Almirola (5): The last spot in Group B came down to Clint Bowyer or Aric Almirola. I decided to go with the No. 10 car because he has been a top 10 machine. He has finished in the top 10 in 11 of his last 13 non-plate races. He was heading to the front last week when William Byron got loose and took him out. Almirola ran well in the night race at Richmond last year. He qualified 6th, scored stage points in both stages and finished 5th. He also finished 4th at Phoenix this season (a similar track). Almirola should bounce back after his blow up at Bristol. Matt DiBenedetto (7): DiBenedetto has always overachieved at Richmond. Last year he qualified 27th and finished 16th in this race while driving for the underfunded GO FAS Racing. Now he will be in a Toyota for Leavine Family Racing with full support from Joe Gibbs Racing. He should be able to finish inside the top 20 Saturday night. I used my first allocation with DiBenedetto last week and I may use another one this week. Ty Dillon (8): Germian Racing moved their shop to Welcome, North Carolina so they could be closer to Richard Childress Racing. This means the team could easily take their cars to RCR to use their Optimal Scanning System (O.S.S.) to ensure the cars were trimmed out when they unloaded at the track. This move has really helped Dillon this season. He has a 14.3 average finishing position on the tracks under 1.5-miles in length. Dillon finished 15th at Phoenix earlier this season. I think he could add another top-15 finish Saturday night. I will post my final picks for Driver Group Game Saturday morning.